Real Awesomeness With Rachel On Her Senior Session! Real awesomeness was what we experienced, really from the moment Rachel and her mom Wendy walked in the door for the first time! We instantly fell in love with these two – the consultation went way longer than usual and we were laughing and having a blast. We knew this session would rock! 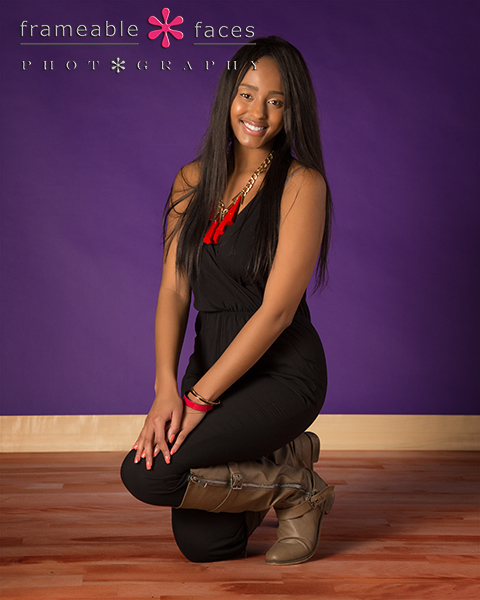 Rachel is a cool girl – beautiful, really funny and she’s a North Farmington Raider like us! We planned a great day with some studio work, some city stuff in Birmingham, and some pretty stuff too including a few shot with their golden lab Dude! Love it – especially the black clothing on the black background – people expect that you can’t really do that but if you light it properly it’s fantastic. Before we head outside with the location photos let’s take a look at some of the behind the scenes action from the day. First we have our 6 second looping Vine AND I’m also including our fun snapchat story while we’re at it. Next we have our epic replays from our live Periscope broadcasts… these particular replays do not have the synced comments but they’re still fun especially when Wendy takes over to guest host a bit! If you haven’t downloaded Periscope yet you can do so and follow us at @frameablefaces here. Next we headed to a secluded spot along a stream that we love for this one we’ll leave you with! Yes this was real awesomeness alright… We loved our day with Rachel! We hope you enjoyed the highlights of her session! Marveling At Marie And Her Spokesmodel Session! Love the way the peach blends into it and Marie looks amazing! Meanwhile we gave our Snapchat geofilter another whirl on this day – it was a pretty big day for the studio since we did a “Snapchat swap” with one of our Periscope friends Chris Strub where he took over our account and vice versa. Here is a clip from our snap story from the day with our logo geofilter at the bottom and Marilyn chillin’ in the background which Marie comically points out… haha!!! …and the first Periscope replay from the live broadcasts we did during the session so you can get a little more of a sense of the fun we have! Okay now let’s get back to a couple more photos! Lastly we have one of our “signature moves” of the “black and blowy” setup which always delivers… and Marie knew how to deliver here too! 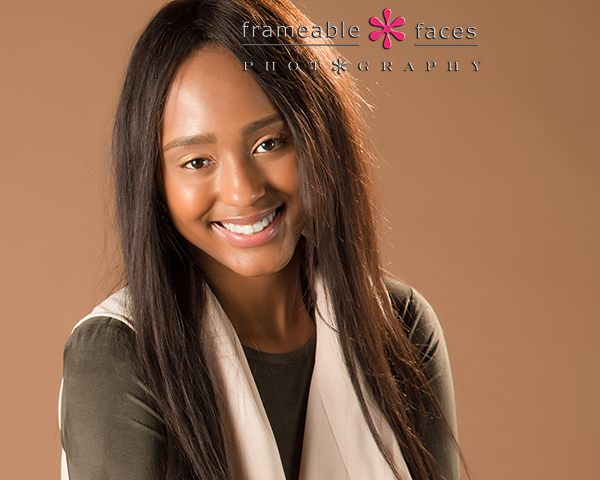 And there it is – you can see why we’re marveling at Marie, and why we can’t wait to get her back in here for her senior portraits later in the year! 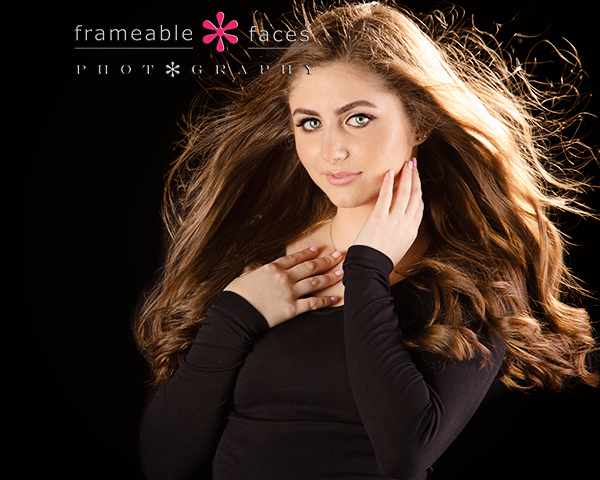 We hope you enjoyed the highlights from her spokesmodel session! 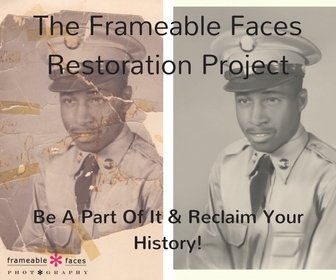 The Frameable Faces Restoration Project! 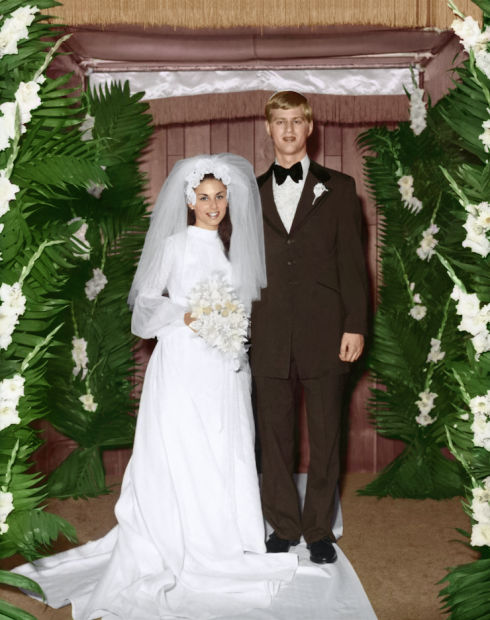 Photo restoration is a special opportunity for us to help people preserve and even recover a piece of their own history that has been damaged or thought to be lost. When someone brings in a damaged photo, we have it restored to pristine condition and return it to them and we see the tears of emotion and joy that pour out when they see the results – these are some of the best moments we have here. A lady brought in this last photo she had of her late brother from before he went off to war. He returned from fighting but he was never the same. This photo was faded, browned, torn, taped, incomplete and stapled to a manilla envelope (you can actually see the staple at the top of his hat). It meant a lot to her and it meant a lot to us to present it back to her completely restored. This is such important work. Helping people reclaim their history. 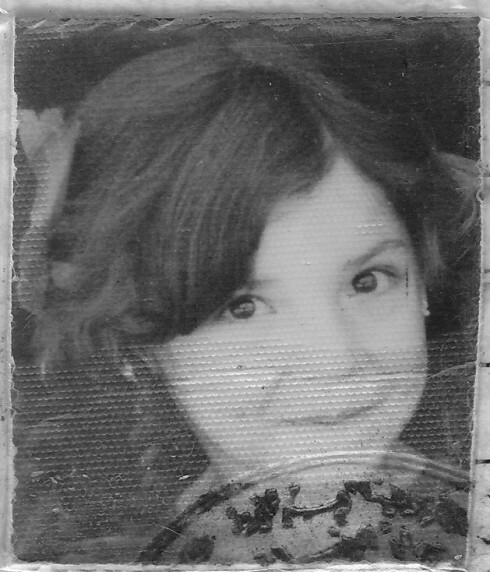 Next one of our seniors had a photo of his mom from her passport from when she came to this country as a young child. 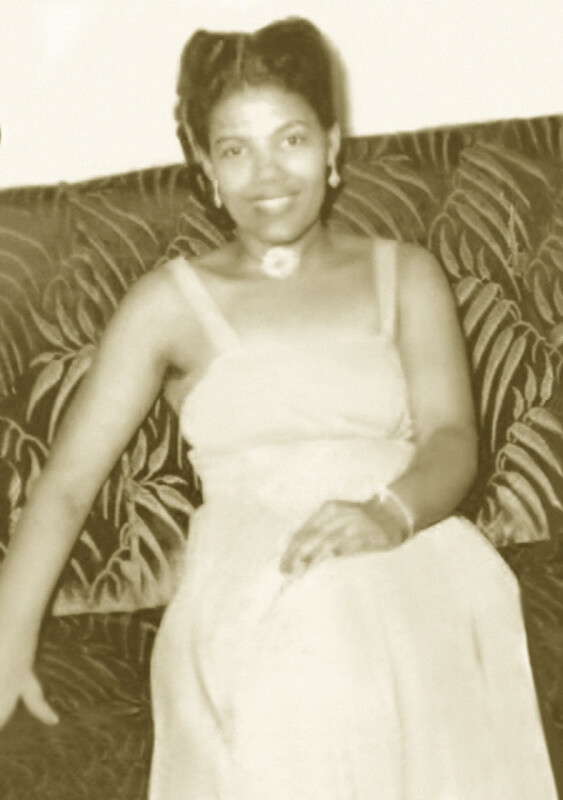 It is the only photo that exists of her from before she came to America. It was tiny and had part of the raised stamping from the passport on it – not exactly in great condition. 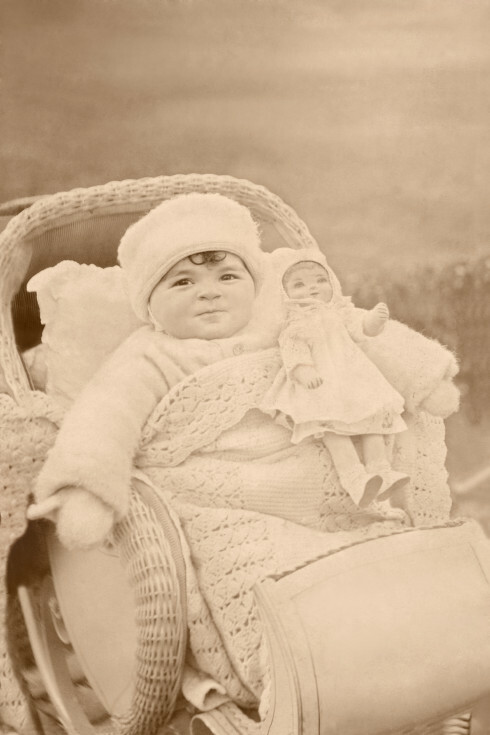 Next we have a baby picture of a lady who came to the studio while in her 90’s. 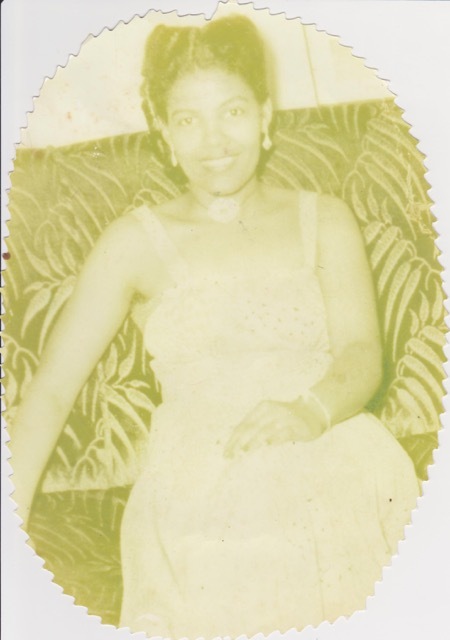 Such a sweet lady, Lucille’s photo had some damage around the edges from the frame it was in, a couple of creases and stains, and the photo was fading a little. The element we are adding to make this more of a project is the live video element. We have an amazing community of people we have connected with literally all around the world on Periscope. If you are unaware of Periscope it is a live streaming app owned by twitter and you can download it and follow us at @frameablefaces at this link. At any given time in one of our live broadcasts you can be a part of a social video watching and chatting in real time with people from Australia, Israel, Turkey, Brazil, The UK, France, Russia, Malaysia, Serbia, Nigeria, India, Pakistan, Germany, Spain, Morocco, Ukraine – the list goes on and on. 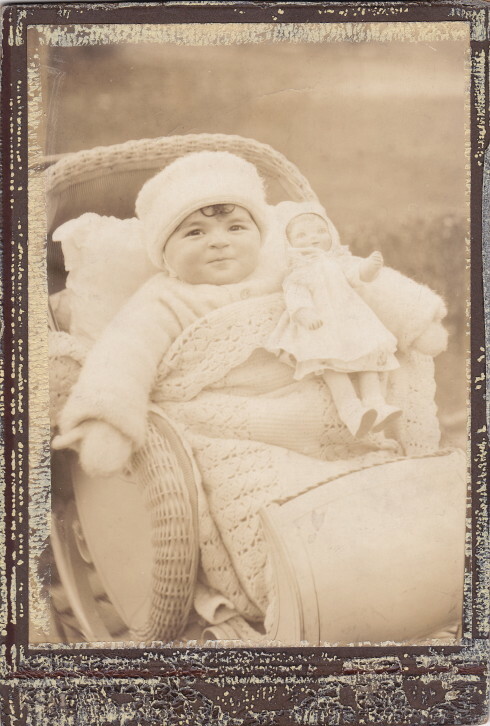 If someone in Sweden has an old damaged photo they want to restore they can scan it and send it to us digitally. Periscope has allowed us to connect with people all over the world! 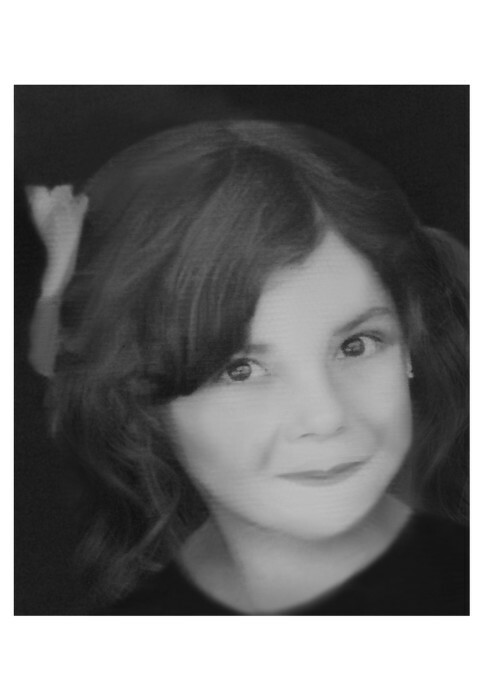 So with the Frameable Faces Restoration Project we are giving people the opportunity to come on to our channel to show the before and after photos and share the story of the photo with the rest of our community. We can then record these and put them all together on a playlist on our YouTube channel. If you don’t want to come on and do a live interview and would prefer to just give us the story separately for the blog that’s fine too! The main thing is sharing stories with our community, bringing us together, reclaiming and restoring history! 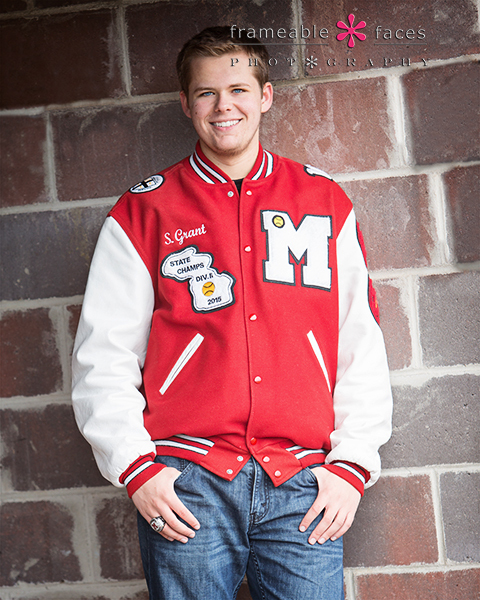 The Thrill Of The Chase…The Sequel – His Senior Portraits! 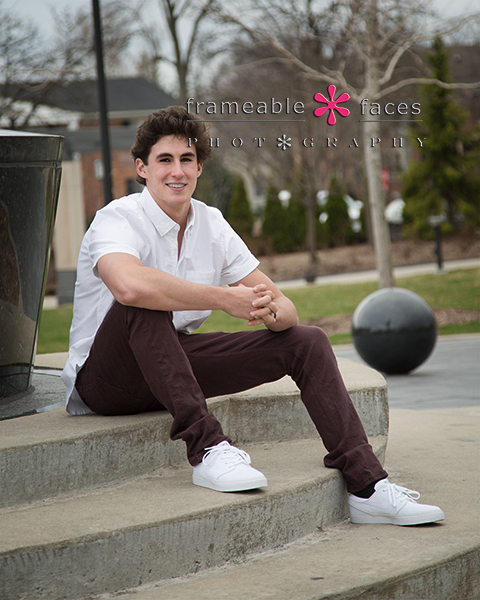 Chase has been one of our spokesmodels for the soon-to-be graduating class of 2016 and you may remember his spokesmodel session on this blog. Chase has a lot going on as we’ve said before with his business with a couple of buddies PWR Detroit, and he’s heading to Indiana University in the fall! 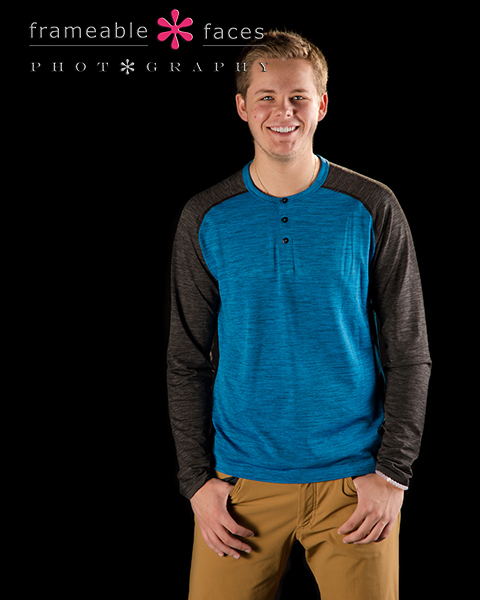 Meanwhile with some scheduling and weather issues for his scheduled senior session we ended up breaking up this session into two different days for the studio half and the location half. No worries – just more days to hang out with this guy…. Let’s start with the studio session which was first where we kept it pretty clean and simple. 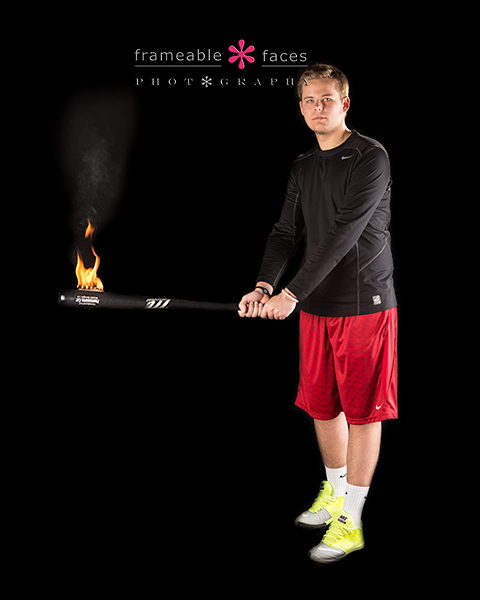 Here we will highlight a couple photos against the white background…. Just relaxed casual looks here – dig it. Next we have the replays of the live Periscope broadcasts from the two days from our YouTube channel. If you haven’t downloaded Periscope yet you can do so and follow us at @frameablefaces here! And now the location part! And there you have it! The thrill of the Chase – the sequel! We’ve enjoyed having Chase represent the studio this year and we hope you’ve enjoyed the highlights from our time with him! As the horrible news of Prince’s passing starts to sink in I have decided I need to write about it. This has nothing to do with our business, and yet it absolutely has plenty to do with our business. It absolutely has plenty to do with everything as people who know me are aware. Prince was my favorite solo artist of all time from the time I was 11 when my older brother introduced me to such classics as Dirty Mind and Controversy. 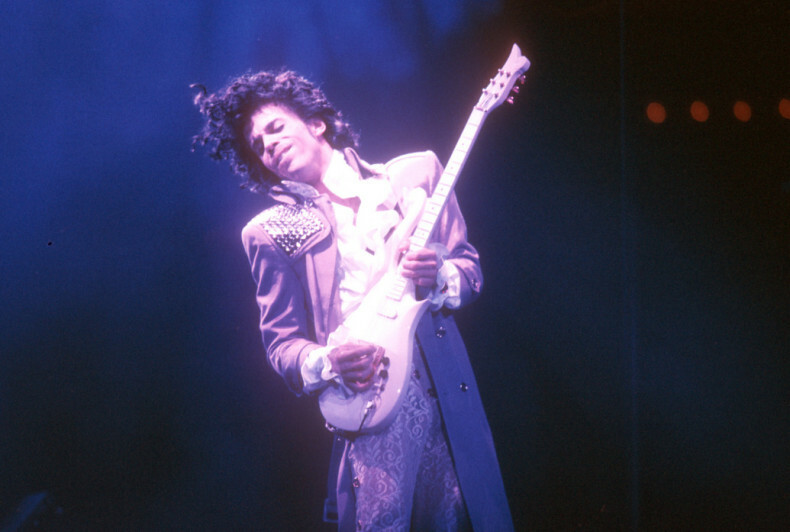 Rules be damned, we have had Prince playing in the studio often and loudly, and we have always done it out of love – to evangelize his art, the gift of music he has always given us. To make it clear to everyone that even though his newer music wasn’t everywhere you went like it was back in the day, that it was still vital and incredible and that everyone should be listening to it. True song craft with real instruments and virtuoso performances on every album. Look at this tweet we got today…. Prince has had a huge impact on our lives. Music to me is like air – I can’t survive without it, and Prince was some of the purest air you could find. Some of My Memories of Prince…. Of all the amazing slow jam ballads Prince recorded – and it’s a massive list, the two best are both on the self-titled second album. It’s Gonna Be Lonely and When We’re Dancing Close And Slow are my jams. Say what you want about Adore, Do Me Baby, International Lover, The Beautiful Ones etc. etc. etc. – I’m sticking to those two and they can take me right back to my bedroom on Glouster Circle when my bed was in the corner of the room and my record player was right at the head of my bed before I got my newer furniture. I would lay in bed and listen to those jams thinking about the day I would meet the perfect girl (I did by the way). 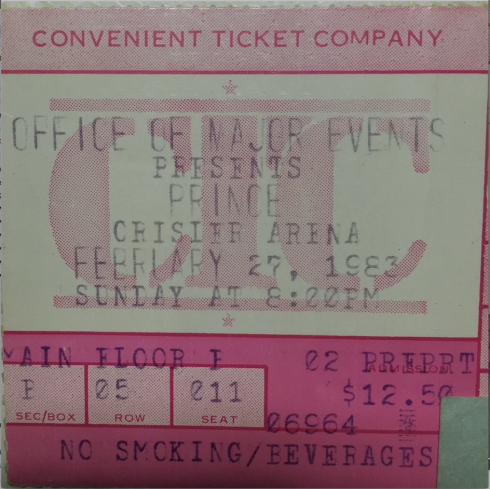 I remember when my brother Jeff called me on February 27th, 1983 from Ann Arbor – I was 12 – and asked me if I wanted to go see Prince at Crisler Arena…. He drove home to Farmington Hills to get me and we sat 5TH ROW CENTER on the main floor for the 1999 tour with The Time and Vanity 6 opening. You’re pretty impressionable when you’re 12, and let’s just say that night was a surreal experience. I’ll never forget it and I am so lucky to have been there. Ahhh… Purple Rain….. and the “When Doves Cry” video! What can you say… I had the band photo from When Doves Cry as a poster on the wall of my room. What about the “extended” concert special footage MTV showed that one time from the Purple Rain tour? Pretty sure I have that on a VCR tape somewhere. Even just the mystery and mythology surrounding the man… it rubbed off on anyone associated with him. Even when Dez Dickerson made his appearance on stage in Purple Rain it was a big deal… like WHOA – it’s Dez!!! That Around The World In A Day cover – I remember the day I picked up that album at the Record Outlet on Orchard Lake Rd. Does anyone not think of Prince when it snows in April? Just asking… Parade was released right when I took a trip to visit my brother Dan at law school in D.C. – I can picture driving into D.C. from the airport listening to it. Vanoy Hill told me he had a bootleg vinyl copy of The Black Album in high school…. he never produced said copy and I was NOT happy… worst tease ever. Was anyone on the hunt for that like I was? As a side note if this is going on too long I’m sorry but it is what it is. I need to do this. My best Prince bootleg is a cassette of a live show from the Europe tour of 1989 – the guy at the record store in the strip plaza next to our mall where our studio is now made the copy of it for me. I can’t for the life of me remember what the name of that store was. I have it ripped to my iTunes now – it was the Lovesexy tour. A fantastic recording including a medley he played by himself at the piano of When 2 R In Love > Venus De Milo > Starfish & Coffee > Raspberry Beret > Condition of the Heart > Strange Relationship > When 2 R In Love. Just gold…. Jamming Diamonds & Pearls around Ann Arbor my senior year when I was delivering burgers and Chinese Food… including the CD single of Gett Off with all the different remixes… That hologram cover!!! Back home in Michigan with The Gold Experience – for some reason have a memory of listening to P Control in my Isuzu Rodeo driving into Birmingham on Maple Road…. Listening to Emancipation driving out to Ally’s parents boat in the summer and jamming it in Atlanta when I was down there for training for one of my hellish corporate jobs – oh the irony. The list goes on and on…. this has been therapeutic. I was not prepared for this. It didn’t register when I saw it come across my twitter feed. Way too many artists have been lost in the last year. They have all hurt but I’m not gonna lie, this one I’m having a much harder time with. I wish I could have told the guy how much I admired his talent, his passion, his gift – how much he meant to me. I hope he knows. Prince – thank you from the bottom of my heart. You will never be forgotten. I Wish U Heaven. Great Scott! 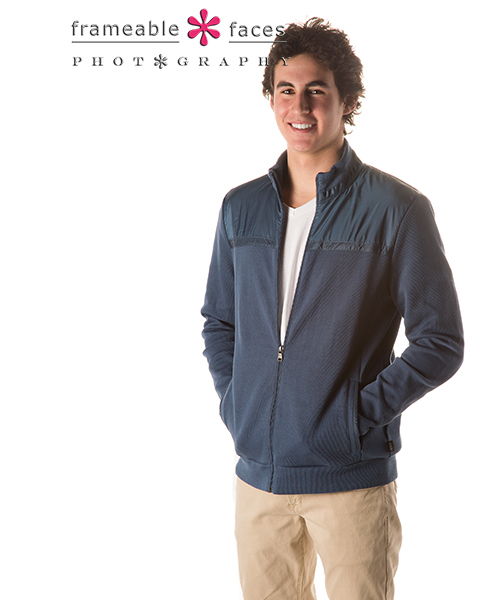 What a senior session and what a senior! Great Scott! 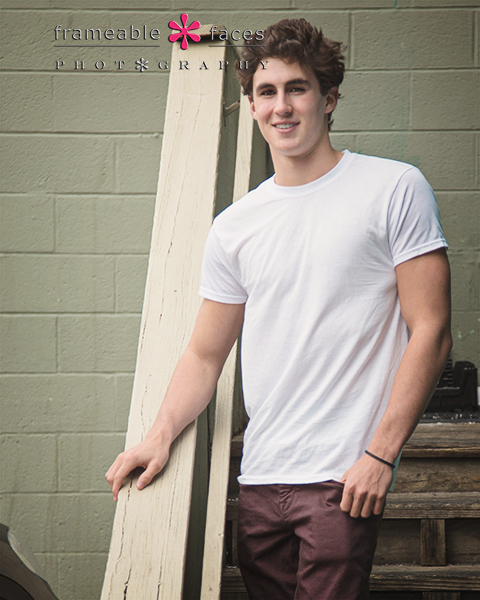 What an appropriate exclamation for Scott’s senior session! We love this kid – he and his mom Marilyn are such a blast to be around and for us it was a lot of fun because Scott reminds us a lot of our son Tony. He looks like him and he even talks and acts like him a little – it’s crazy! 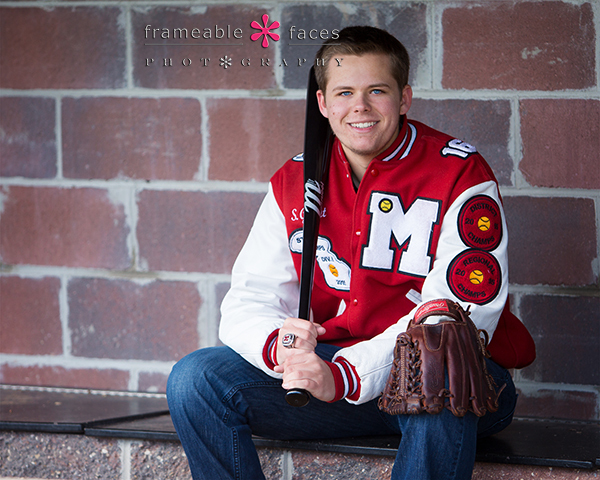 The guy is an accomplished baseball player at Orchard Lake St. Mary’s Prep High School and that’s where we went to get some photos of this defending state champ at his home diamond. That’s one good looking dude. Next we have the Periscope replays from our YouTube channel. You won’t see the live comments in these broadcasts but there was indeed a live audience commenting including Scott’s girlfriend who saw the notification in her twitter feed, grabbed the app and jumped into the conversation in the location segment of the replay – that was a first for us and it was hilarious! You can download Periscope here and follow us at @frameablefaces! And there you have it! Great Scott indeed! We hope you enjoyed the highlights of our day with him! 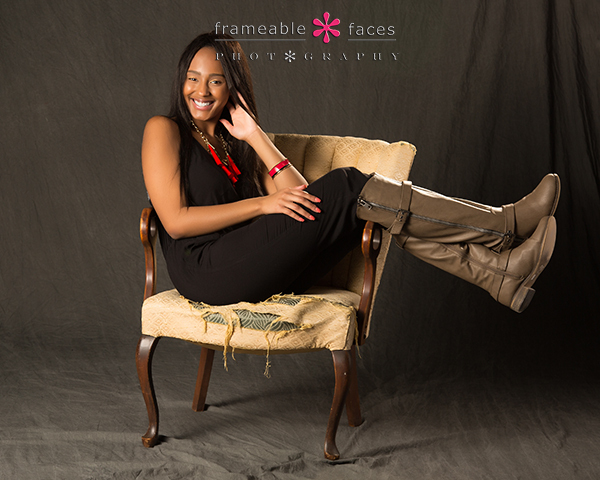 Havin’ Fun With Haven On Her Spokesmodel Session! Haven is a gem. We’ve known this for a while since her older sister Jubilee was a spokesmodel for us for the class of 2015 and Haven has been friendly with our daughter Lacey since they started high school. Notice a theme here? Our spokesmodels this year are largely “Lacey approved” since this is her graduating class! Haha – well that hasn’t actually been our main criteria but we think Lacey has good taste and we had a feeling that Haven would be a great spokesmodel when we met her a couple years ago. We decided to spend Haven’s whole session in the studio since our weather wasn’t so cooperative and as we’ve always said sometimes it’s nice to just stay in the studio to relax and play with some different combinations, colors, backdrops, furniture, floors etc… So yes – we were havin’ fun with Haven! So we started out with the tan paper backdrop which was perfect for Haven’s first outfit. We love the earth tones here along with her skin tone – it all comes together really nicely! Oh and it doesn’t hurt that she’s stunningly gorgeous! We also experimented on this day for the very first time with our new Snapchat on-demand geofilter! Our Periscope friend Vincenzo Landino wrote this article on these and we jumped on it! It worked out nicely and we’ll be playing with this more down the road – it’s not permanently available but we’ll announce the days it’s on on twitter. 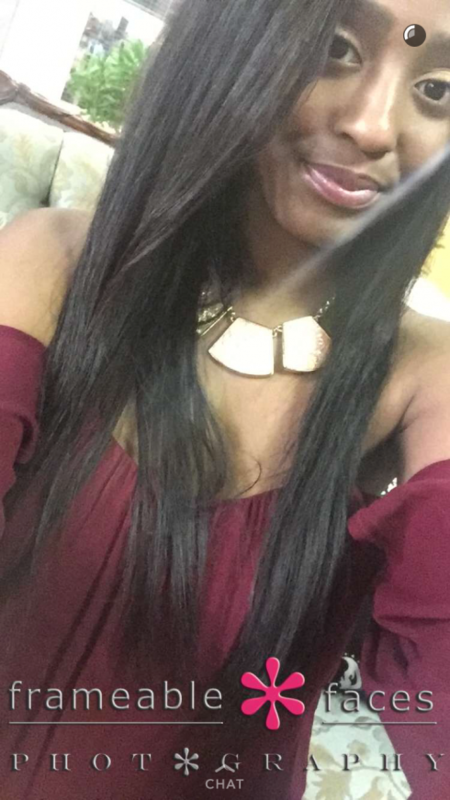 Here is a snap that Haven herself sent out that day… the little circle in the middle of her forehead is the snapchat timer while I was grabbing the screenshot. Check out the snazzy Frameable Faces filter! 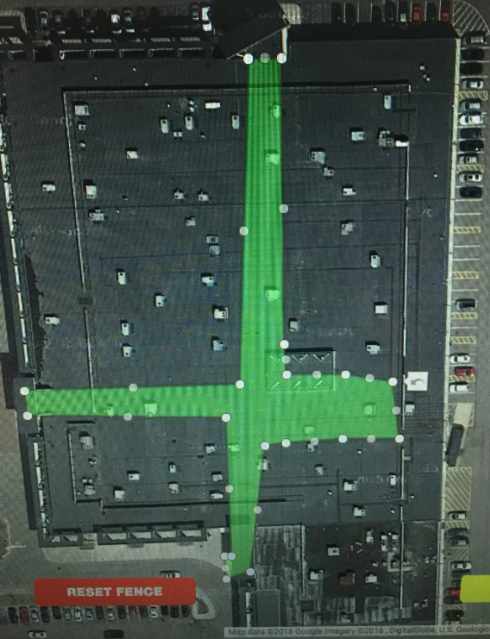 Here is the geofence we submitted to snapchat that shows where the filter was available – in and around our studio and down the common hallways of the mall! Here is the first snapchat video we sent out with our filter – as you can see we had some snapchat fun that day! Okay let’s get back to a few more photos…! …and next we also have a couple replays of our live Periscope broadcasts from our Katch.me page – if you haven’t downloaded Periscope yet you need to! 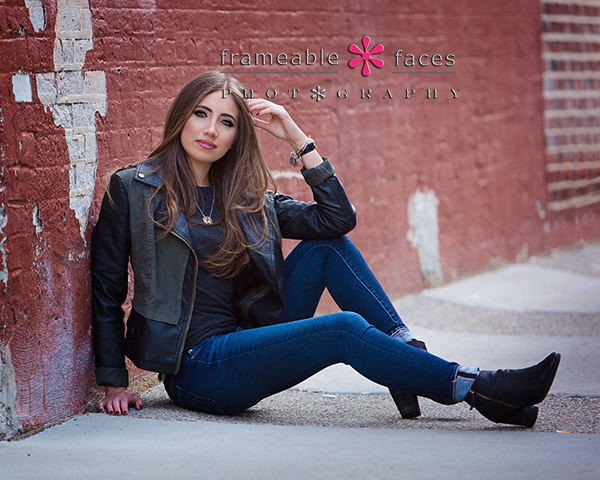 Tune in for Frameable Faces TV at @frameablefaces by downloading the app here! And here is one of the results! That’s a fantastic note to end this on…. we are thrilled to have this girl representing our studio this year and we look forward to her senior session later in the year!!! We hope you enjoyed the highlights of our day with her! Me: Frameable Faces this is Doug! Phone Caller: Uh hello – we have a bit of an urgent situation here with a maternity session…. um – you see my wife…. well are you available to take photos of my wife today? Me: Wait – is she in labor????? What happened was that Nick and Jen were 36 weeks pregnant and had a maternity photo session planned with another studio that day. They were all prepared with clothing and Jen had her hair and makeup done only to be told that the studio had double booked them and they were out of luck. Sorry, no go, thanks for playing. 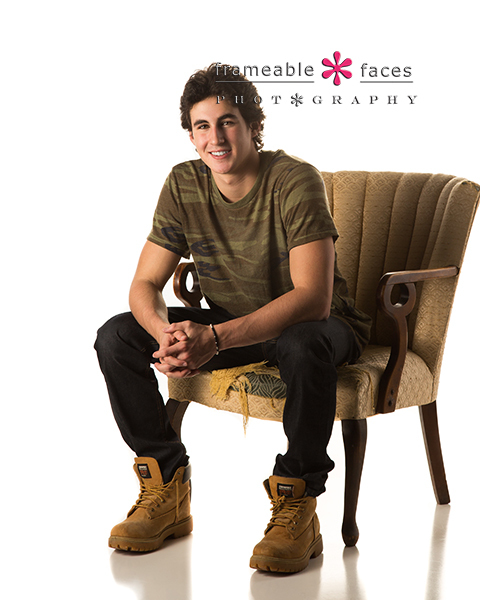 Nick did a quick search on Yelp, came across Frameable Faces and took a chance with a phone call. Now keep in mind that this is NOT how we do photo sessions here. We don’t take walk-ins as a general rule with no consultation ahead of time to plan the session where we can get to know the clients and make sure everyone is prepared and on the same page. But these folks were in a bind and we didn’t have any appointments that afternoon – and my gut (after checking with Ally) said to go with it. 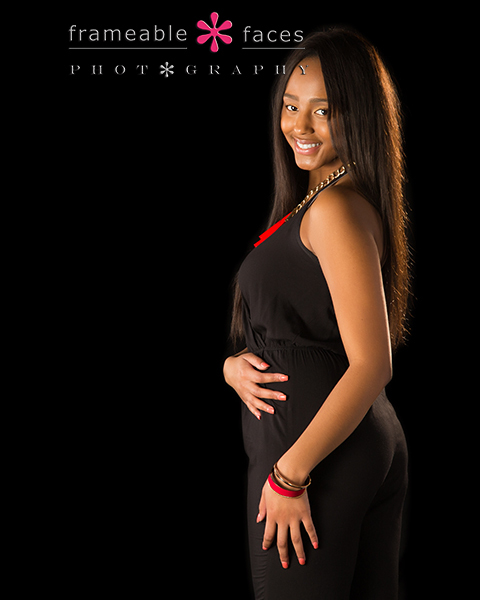 We were not expecting a session that day, and they were not expecting to have to shift gears and drive almost a half hour to a studio they didn’t know on the fly for a maternity session which can be a relatively intimate affair. But from the moment they walked in we connected – it felt right and it turned out to be one of the best maternity sessions we’ve ever done. What a wonderful couple – we even broadcast some of the session live on Periscope and you can watch the replay below, but before we get to that let’s see a couple of the photos! We used two different backdrops starting with the black above and the next photo is also on the black with the sari stretched out behind Jen and her hair gently blowing – beautiful! Here is the link to the broadcast. Now let’s get back to a couple of gorgeous photos of Jen on the white background. So beautiful, so angelic! We can’t wait to meet the baby! Maybe, just maybe you’ll have a chance to meet the baby here too! 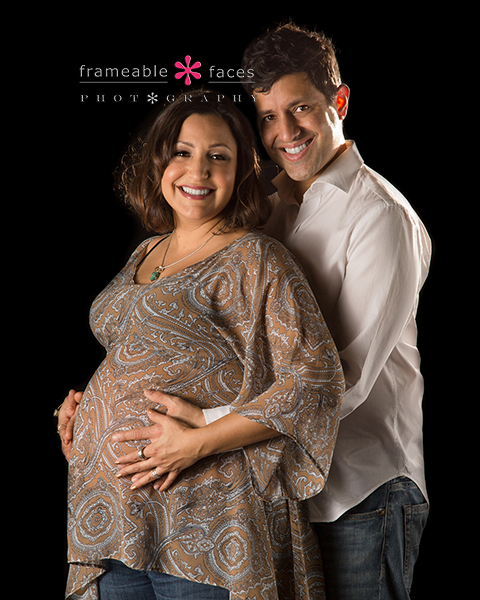 We were thrilled to be able to meet these two, photograph them and present them to you! We hope you enjoyed the highlights – serendipity indeed.